In days gone by, GT, as in Grand Touring, was generally reserved for aristocratic automobiles, usually from Europe, or American muscle cars. Then hot hatches got in on the act. These days, GT seems to be bandied about, being given to any ‘below stairs’ vehicle showing spirit. Take the new Cerato GT from Kia, for example. Does it stack up to the top-shelf suffix? The South Korean car maker thinks so, with its best-selling model, the Cerato sedan and hatch, adding a 1.6-litre turbo model and a ride and handling package coming up with the most focused drive in its small-car range. From the get-go, the Cerato GT shows off its distinctive wares with body kit, dual exhausts, steering wheel-mounted paddle shifts, alloy sports pedals and flat-bottom sports steering wheel. However, the heart of the flagship is the four-cylinder 1.6-litre turbocharged petrol engine producing 150 kW of power at 6000 rpm and 265 Nm of torque between 1500 and 4500 revs, driving the front wheels through a seven-speed double-clutch automatic transmission, with Sport mode. A local ride-and-handling team of engineers were called on to make the best of the car’s multi-link independent rear suspension, under Australia’s wide-ranging road surfaces. 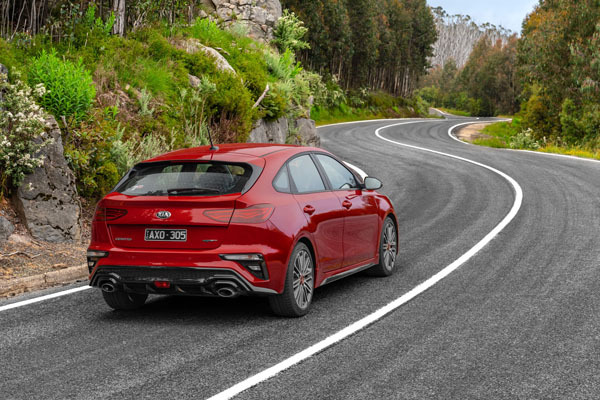 “It was quite a balancing act to optimise the sporty possibilities of the GT platform, while still keeping the owner happy with driving in day-to-day activities,” says Kia Australia’s general manager for product, Roland Rivero. The Cerato GT Hatch is longer by 160 mm, wider by 20 mm and 10 mm lower than the standard hatchback yet sits on the same wheelbase. Overhangs are increased 20 mm at the front and 140 mm at the rear, resulting in more luggage space, up 43 litres to 428 litres. Engineers increased body stiffness for added safety and better handling in line with its sporty exterior and delivered a quieter cabin, all shown off well in a launch drive in Melbourne and the Yarra Valley. Steering feel over the previous model has been upgraded through enhanced column-mounted motor driven power steering, reducing unwanted steering feel and friction. An already reworked suspension in the non-IRS models was improved on for the GT, which combined with better throttle and brake feel offered a smoother response to turn-in and shorter stopping distances than before. Sport mapping added steering sharpness and weighting, as well as more precise shift points in Sport Mode, combine with a more aggressive suspension tune, larger ventilated front disc brakes and 18-inch alloy wheels, to offer above standard stopping performance. Infotainment is taken care of by an 8-inch touchscreen display, Apple CarPlay and Android Auto with voice recognition, wireless phone charger, eight-speaker JBL Premium sound system and Bluetooth connectivity. 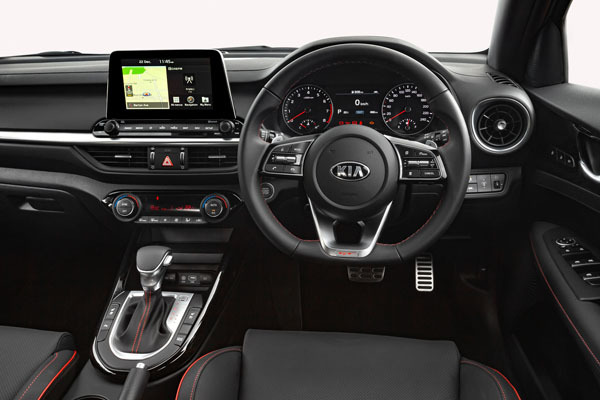 Further cabin comfort features include climate control air-conditioning and ventilated front sport seats. The Cerato GTs take on all the active and passive safety systems of the Cerato range, winning a five-star ANCAP safety rating. These include autonomous emergency braking that includes pedestrian and cyclist, forward collision warning, lane keep assist, rear-view camera with dynamic guidelines, driver attention alert, front and rear parking sensors, drive mode select, six airbags, tyre pressure monitor, speed limiter, eight-way driver seat adjustment with two memory positions and smart cruise control. Colours to go with a GT performance include Snow White Pearl, Silky Silver, Steel Grey, Platinum Graphite, Horizon Blue, Gravity Blue, Aurora Black Pearl, Runway Red and Sunset Orange, which is exclusive to GT. 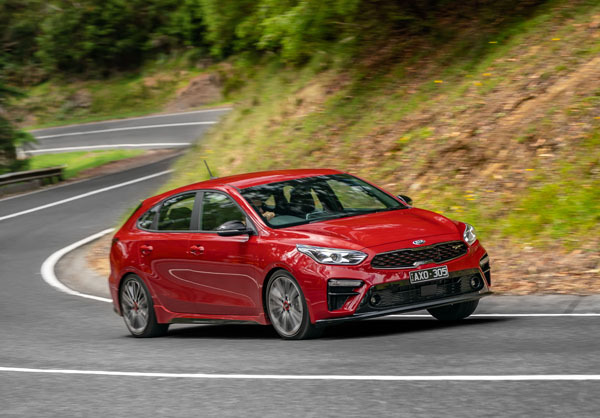 “Australian drivers are like few others in the world,” says Kia Motors Australia Chief Operating Officer Damien Meredith. “They know what they like … and what they like is that rare combination of style, value and performance which doesn’t come along all that often. “With the Cerato GT they have one additional opportunity to find what they are searching for and this time it is wearing a badge which comes with proven value and reliability. Note: These prices do not include government or dealer delivery charges. Contact your local Kia dealer for drive-away prices.